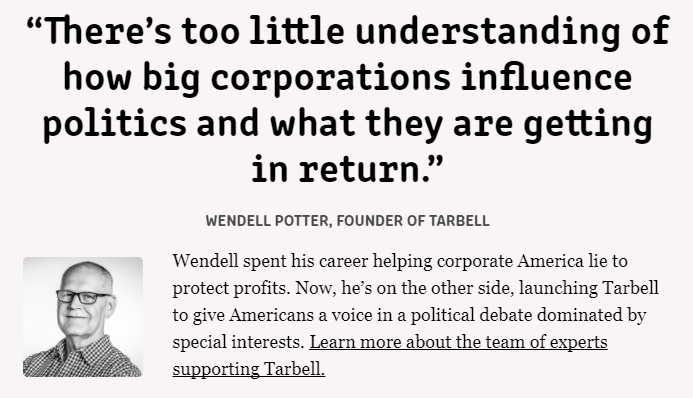 Columbia Journalism Review's Trudy Leiberman interviewed Tarbell's founder, Wendell Potter, about the stories Tarbell will tell, our sustainable business model and how Wendell's tenure in corporate PR brought him to start this venture. Click here to read. WASHINGTON, DC USA -- PHARMA UPDATE NEWS SERVICE -- OCTOBER 21, 2017: Few people realize the control corporations and special interests have over the United States. Their influence on our government allows them to shape our society and our daily lives in ways that further only their interests, not the interests of the citizens our government was designed to serve. It is distressing that this influence wielded by corporations and special interests faces so little scrutiny. The only way to combat their hidden control is for journalists to shine a bright light on where your interests are being undermined -- and help citizens understand how to fight back. Meet Tarbell. Our sole mission is to be your spotlight. We will answer only to you, our readers. Our investigative reporting will help you see how the powers that run America are working against your interests. Tarbell will be your trusted source -- and together we will improve our democracy and our country. Ready to become a founding member of this new, dynamic journalism? Then join the movement to launch Tarbell, build a better America and a stronger democracy. Wendell Potter spent his career helping corporate America lie to protect profits. Now, he's on the other side, launching Tarbell to give Americans a voice in a political debate dominated by special interests. 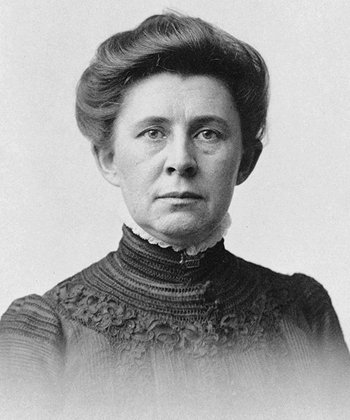 Tarbell is named in honor of Ida Tarbell, who was a Gilded Age reporter often credited with founding investigative journalism. She took on the corporate titans of her day and inspired many "muckraking" journalists. She inspired us. 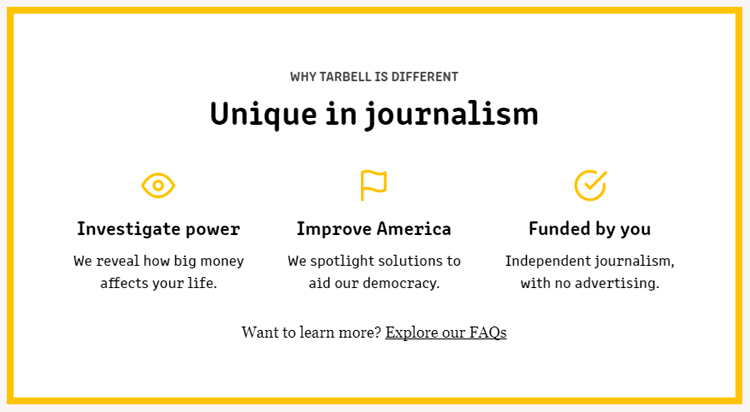 Tarbell will be: Independent, nonprofit, digital, aggressive -- and largely funded by readers like you. It will report on the sectors where moneyed interests can make the most mischief, from health care and the food and beverage industries to energy, technology and financial services companies.